Can I suggest an alternate to the 24 hour moratorium on answering? Previous winners must wait at least one hour for each win that they have before posting a solution - other comments would be okay. Think of it as a progressive tax - the more wins you have, the longer you wait. Newbies can get started right away. We'd use the official post time on the blog as the starting gun. This method wouldn't go into effect until WoGE #34 and could only be invoked at the start of a challenge and at the sole discretion of the person posting the challenge. (If you like we can call this the "Schott Rule" for short.) I'd certainly be willing to abide by this. If others have suggestions for improving this rule I'd certainly welcome discussion. I'm working on an official tally of victories which I'll include in my master compilation of previous winners (in the info box on the main description area). 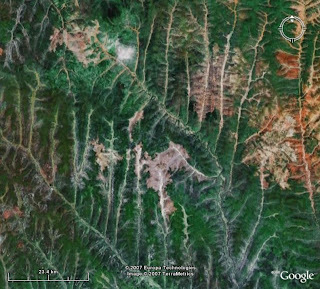 Goggle Earth now shows massive clearcutting in California - visit not for profit site - wwww.stopclearcuttingcalifornia.org to see or www.epfw.org -- Sierra Pacific Industries is doing this massive clearcutting unchecked. The world needs to see what is happening in this great environmental state with an "environmental" governor. Nice guess, but this is not California. It was awesome! Can't you see the pictures? Any guesses other than California? This one almost cured me of my WoGE addiction. I finally found the spot in some godforsaken corner of Siberia. I tried looking around online for a decent geologic map of the region but the best I could find, USGS OFR 97-470E, was pretty useless for this purpose. If someone else knows more about the geology here feel free to elaborate. Now if I had WoGE #33 to do I suspect I'd have chosen Latrobe, PA - "33" being the mystery number painted on the side of every Rolling Rock beer bottle. (And I assume the connection between geology and beer is crystal clear for most of you.) But alas, it looks like I've got #34, for which I can think of no immediate geologic significance. Okay friends, WoGE #34 is posted. And though I haven't consulted with a geophysicist, it's quite possible the crust is indeed right around 34km in the challenge area.